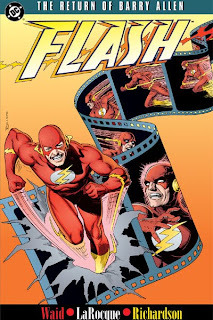 It's Flash Week on Collected Editions! Check back every day this week (yes, now five reviews this week!) for special Flash reviews. One of my favorite collected stories is writer Mark Waid's Flash: The Return of Barry Allen. It was my gateway and first introduction to all things Flash in the form of Wally West, as I imagine is true for many modern readers; as I'm on the precipice of reading Flash: Rebirth, which replaces Wally West with Barry Allen as the titular Flash of the DC Universe, I re-read The Return of Barry Allen with some uncertainty. The book builds the case for Wally West as the Flash so well that it's difficult to imagine an equally strong argument in the other direction. I recall from the text pieces of 52 that Mark Waid has some affinity for "locked room" mysteries; similarly, Return of Barry Allen distinguishes itself perhaps first of all because it's such a cogent whodunit. Waid gives air to all the readers' natural suspicions, through Wally, in the first chapter, and seemingly brings that mystery to a close; for much of the book, the reader's question becomes "What's wrong with Barry Allen," not "Who is Barry Allen," effectively distracting from the mystery's solution. Waid can't possibly let slip the book's mystery villain's name else the surprise be spoiled immediately; instead the book offers clues in supposedly innocuous mentions of the death of Wally's Aunt Iris -- without saying so outright, Waid gives the readers all the clues they need to solve the mystery. Waid's later Wally West stories like the also-great Terminal Velocity and Dead Heat would give character arcs to a veritable Flash-family around Wally, but Return remains for the most part Wally's story. The three speedsters who fight alongside Wally serve primarily to represent a kind of "ghosts of Christmas" -- Johnny Quick, for instance, tries to teach Wally about speed through science, much like Barry Allen did in Wally's past, and Wally finds little he doesn't already know. Jay Garrick, the Golden Age Flash, represents Wally's present; neither he nor Wally really think about their speed so much as they just let it come naturally. And though Wally is skeptical of the "zen" teachings of Max Mercury, Max ultimately represents Wally's future in both offering the solution to defeating the faux Barry Allen and also later introducing Wally to the concept of the Speed Force. Wally realizes through Max that his memory of Barry Allen has been holding him back; I was never a Barry fan myself, but I imagine this to be Waid's specific message to the Barry fans of the time -- that their love for the past hindered their enjoyment of the present. To drive that home, Wally ultimately finds an even more slavish Barry fan than himself in his mysterious enemy, someone who's so even in love with Barry as to want to replace him; in that way, Wally sees the healthy way toward honoring Barry when faced with the decidedly un-healthy way. Long before Superboy-Prime, the faux Barry Allen is the reader here, and as such we must accept Wally when shown the evil of our ways. As someone who was new to the Flash, what I believe made me accept Wally as "one to watch" at the conclusion of this story is the leadership he demonstrates. In the presence of much older, experienced heroes, Waid has Wally concoct a truly ingenious plan to not only reveal the mystery villain but also to send him on his way, and Wally fulfills the plan with much aplomb. Of course, I also credit Waid for any number of just-cool moments in Return of Barry Allen, from echoing for Wally a deadly scene from Barry's own life to one of the first (and still the coolest) cameos of Barry Allen's ghostly spirit, and from four heroes just sitting around talking about speed for a while to a shout out to Stan Lee and John Romita's "Spider-Man No More," there's little in this story that doesn't work extremely well. It's been a couple years since Green Lantern: Rebirth, and while I recall some trepidation at the time about accepting Hal Jordan as Green Lantern when he'd bored me before, it's nowhere near what I feel about Barry now replacing Wally. Wally's personality has come and gone in recent years, hindered tremendously by his more jokester portrayal in Justice League Unlimited, but in a story like Waid's Terminal Velocity or Dead Heat, the reader has a sense that Wally was the guy, a leader, someone who was going to pull off a magnificent feat. Geoff Johns' later Flash run only cemented Wally as a deep, mature, edgy-but-still sunny hero. In this first story, Waid introduced me to Wally West as the Flash and put to rest for me immediately what hero deserved to be inside that red suit; right now I feel like Barry Allen will have to have a heck of a rebirth to replace what Flash: The Return of Barry Allen set in motion. The Collected Editions Flash Week continues ... tomorrow! Don't miss it! Glad to see, despite your "spoiler" warning, that you didn't give away the secret; as I've mentioned before, I was disappointed I accidentally found out the answer (on Wikipedia) some time before reading this story, and I felt it lessened the impact of the "reveal." I would hope anyone reading this review will be inclined to pick up the book, and will be thankful you didn't spoil it for them. I remember collecting the issues of this story from my local newsagent. This was my first introduction to the flash and it was fantastic. I made the mistake of reading the Life Story of Barry Allen before this one, which pretty much ruined it for me. We've fixed that on our timeline, but for a while it was just so wrong. Still, very enjoyable volume, even with it "spoiled." Great review! Fantastic story. The twists in the story hit like sledgehammers at the time. In pre-internet days the pages held way more surprises. The trade coming out was one of the prime factors motivating me to trade-wait. While there are some integral Waid Flash stories in print, some key ones are glaringly absent - particularly the mini sequel to Underworld Unleashed. That mini-sequel to Underworld Unleashed you mentioned includes the New Year's Evil: Rogues special, and I've always been curious about that story even as I've never picked up the issues. Agreed, I'd like to see that collected. And to see Barry Allen face off against Neron, for that matter. Might just be interesting. What's the name of this mini-sequel? Did it run in the regular Flash series or was it its own mini-series? That would be Flash #127-129, called "Hell to Pay," plus the aforementioned New Year's Evil special. See the Neron entry at Those Who Ride the Lightning.